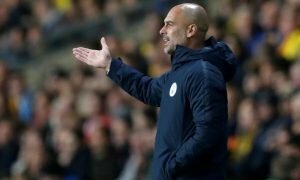 Celtic set to sign Manchester City talent on-loan | The Transfer Tavern | Where football transfer rumours fly or die! Our resident Manchester City fans who are currently enjoying a pint before their game against Everton will be happy to hear that young talent Bersant Celina could be set to make a loan move, according to the Daily Record. The 19-year old is apparently the subject of negotiation between the Blues and Scottish side Celtic as they look to take the attacking midfielder on loan until the end of the season. Record Sport report that Celtic manager Ronny Deila and his assistant John Collins met with City’s officials when they attended the Blues’ Capital One Cup fixture against Everton and they were informed of the possibility of taking Celina on a short-term loan. Manuel Pellegrini handed the Kosovan midfielder his first team debut in their recent FA Cup win against Norwich. But Celina revealed that he is set to be sent out on a loan this month in order to gain more regular first-team experience. Should a deal be completed for the 19-year old, Celina would follow in the footsteps of another promising young talent under contract at the Etihad Stadium after centre back Jason Denayer enjoyed an impressive spell in Scotland, winning the PFA Scotland Player of the Year last season. Celina would also be reunited with Celtic boss Deila, who was responsible for the youngster’s development at Norwegian outfit Stromsgodset before he received a scholarship at City back in 2012. Our Landlord believes that Manuel Pellegrini would view a loan to Celtic until the end of the season to be beneficial having seen the improvement of Jason Denayer at Celtic Park. Manchester City fans, how highly do you rate Celina? Let us know in the comments below!